This is a list of companies that have a very nice estimated one year return on invested capital based on the sum of the delta of the one year estimated price target plus the calculated one year dividend yield. This is a list of companies that are currently hitting new highs plus have an estimated 5 year earnings growth rate in excess of 25%. As this growth is recognized, these shares are pushed higher and become good swing trades. This is a list of companies that have recently increased their dividends. The list includes the amount plus the per cent increase, the forward dividend yield, and the ExDividend, Record and Payment dates. Markets moved higher last week but they struggled as they moved the needle higher just one half of one percent. From a technical point of view the DJIA is approaching a triple top and technicians are monitoring this situation closely to see if this average will break through the 27K level. If it does, the 30K level would now be on the horizon for the second half of 2019. That level is about an 12% above current levels and is very doable assuming strong earnings are released in the second half as expected. This week I'll be watching Sunworks (SUNW) and Fluent (FLNT) to see if they continue their moves higher. Good Luck. Tuesday Summary: It's earnings season again. This is the week we experience the bulk of the announcements and so far they're pretty good. So much so the the markets are starting to move into higher territory. And I expect this to continue the rest of the week. Sunworks provides photo voltaic based power systems for the agricultural, commercial, industrial, and residential markets. The company also designs, finances, integrates, installs, and manages systems ranging in size from 2 kilowatt for residential loads to multi megawatt systems for larger commercial projects. Nio (the Chinese electric car company) was pushed higher in late February in anticipation of their quarterly earnings report. In hindsight that was a grave mistake. Guidance was terrible and the stock was severely punished. That too was a mistake. As a consequence I'm going long in the options market. That may end up being my mistake. APPS provides media and mobile communication solutions for mobile operators, application developers, device OEMs and other third parties worldwide. The company offers Ignite, a mobile application management software to control, manage, and monetize applications. It also provides Discover software, which provides application installation and management, as well as detailed reporting to advertisers and carriers. STRM provides software-based solutions and auditing services, which captures, aggregates, and translates structured and unstructured data to deliver predictive insights to its clients. The company offers health information management, coding, and clinical documentation improvement (CDI) solutions, which include cloud-based software solutions. The company sells its solutions and services through direct sales force and reseller partnerships. Streamline Health Solutions, Inc. was founded in 1989 and is based in Atlanta, Georgia. These three companies (Inseego Corp, Liquidity Services, and SMTC Corp) are interesting because they're all started moving higher on increased volumes. That's something that always grabs my attention. It tells me other traders and investors are also becoming increasingly interested in these shares. Therefore, they're now on my watch list of potential future buys. Companies like these that jump higher are best bought on their first pullback and bounce. It make for a higher probability trade. Companies with great forward estimates that suddenly move above previous Highs are usually moving for a reason and traders should take notice of these events. 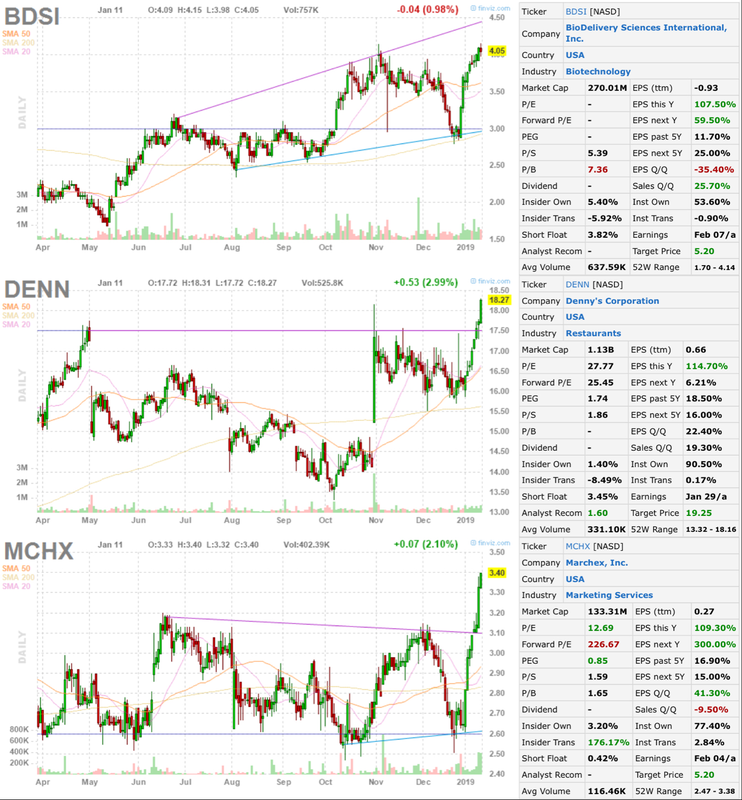 These three companies (BioDelivery Sciences Intl, Denny's Corporation, and Marchex) are doing that right now. Each company is worthy of further analysis and looks to move higher in the weeks and months ahead. Word is slipping out of Washington that progress is being made toward an agreement with China on trade tariffs. While great news for the US, it's also great news for re-energizing the Chinese economy. That should propel Chinese shares and that's why I'm once again interested in investing in Chinese companies. Last month was the worst month for the DJIA since 1931. For those who don't remember, that was the Great Depression. And for almost a century no one thought it could ever get that bad again. But fundamentals are a lot better these days so let's hope history doesn't repeat. Mercury General writes automobile, homeowners, commercial automobile and property, mechanical protection, fire, and umbrella insurance through a network of independent agents and direct channels. Mercury General was founded in 1960 and is headquartered in Los Angeles, California. Century Aluminum Company, together with its subsidiaries, produces standard-grade and value-added primary aluminum in the United States and Iceland. The company was founded in 1995 and is headquartered in Chicago, Illinois. Voya operates through Retirement, Investment Management, Individual Life, and Employee Benefits segments. The company was formerly known as ING U.S., Inc. and changed its name to Voya Financial, Inc. in April 2014. Harmonic Inc. designs, manufactures, and sells video infrastructure products and system solutions worldwide. Its products enable customers to create, prepare, and deliver a range of video and broadband services to consumer devices, including televisions, personal computers, laptops, tablets, and smart phones. The company operates in two segments, Video and Cable Edge. Sometimes it's good to take money out of the market and enjoy the spoils of investing. Not everything needs to be continually reinvested back into the markets. Three years ago I decided to spoil my son. So I got him this Nissan 370Z. It's been a great car. He's been a great kid! Interested in reading more articles like the ones above? I've been writing articles for over three years and many of my best ideas can be found in those articles. Click the button below or use the drop down menu above labeled "INDEX". Reflection is often the first step in finding success in the markets. I like to keep things simple when I invest because I'm a pretty simple guy. And I don't think there's a simpler or an easier way to invest than "Buy, Write, Collect". Here's the three steps in their entirety. 1. Buy the Stock, 2. Write the Option, and 3. Collect the Dividend. If you’ve ever considered an options strategy as part of your overall investment strategy, here’s a relatively simple trade that I often execute to supplement my dividend income. I've listed companies increasing their dividend in the Dividend Increases part of this site because I've found this to be a fertile area for finding candidates for consideration. Companies that pay an annual dividend of at least 2% and increase that dividend at a rate greater than inflation for a number of years are the kind of companies that every DGI is attracted to. And if that company has a one year estimated capital gain of 10% or more, I start to buy shares in that company. I've posted a lot of great companies that have raised their dividend pretty consistently over the years and that's the key to becoming a successful investor. It's really not as hard as most people think. Study those companies that raise their revenues, earnings and dividends over an extended period of time. Read their history. And learn what makes a great investment. Where are all the Ads? I am not a licensed investment adviser, and I am not providing investment advice for you on this site. Please consult with an investment professional before you invest your money. Any opinion expressed here should not be treated as investment advice. I am not liable for any losses suffered by any party because of data or information published on this blog. Past performance is not a guarantee of future performance. Unless your investments are FDIC insured, they may decline in value.